Research is commonly defined as a systematic investigation with the intent to verify facts and generate updated conclusions. Regarding its utility, research is divided into two: basic and applied. Many researchers suggest that these are closely working with each other as basic research is a platform which applied research often uses to solve real life problems. Also, basic research employs technology (which was developed by applied research) to address its objectives. Thus, these inquiries form a cycle of advancement. Generally, applied research deals with particular topics which have direct practical relevance. On the contrary, basic research is mainly motivated by the expansion of knowledge and seek to answer questions that are not related to direct applications. The following concepts delve into such distinctions. Basic research is also known as fundamental or pure research since it is mainly concerned with the improvement of scientific knowledge. The purpose of basic research is simply to gather more information to further understand existing phenomena specially in the field of natural sciences. Its focus is on supporting as well as challenging assumptions which aim to explain various phenomena. Pure research looks at the “big picture” in the sense that it looks for overall factors and related postulates. Hence, fundamental research is purely theoretical as it delves into basic laws and principles. Though the engendered ideas may not be directly applied to current situations, such conclusions from basic research are highly fundamental in enhancing future applied studies. For instance, previous studies on mathematical theories have been utilized in programming and other information technology processes. The purpose of applied research is to know more about a certain real-world problem and take steps to solve it. It focuses on the application of natural science principles on practical difficulties as well as enhancing innovations. Such studies are often associated with the fields of business, economics, health, and politics. For instance, a company may hire an applied researcher to look into the best way of hiring applicants and placing employees in connection with the organization’s various positions. Many applied researchers utilize the naturalistic observation method to verify existing social difficulties and then conduct experiments to ascertain solutions. However, data gathering challenges such as ethics and validity issues may arise specially when testing procedures may pose harm for humans and animals. Thus, restrictions are applied in employing the respective study procedures. Basic research is meant to expand one’s current knowledge while applied research is aiming to solve particular life problems. Basic research is more theoretical since it generally generates theories and explores information which may not be presently applied. It is also focused on improving current academic concepts. On the other hand, applied research is more practical and descriptive in nature as it seeks to alleviate current problems in various fields and is mostly concerned with end-usage. The scope of basic research is often universal as it may bae applied to diverse concepts. However, applied research is largely particular as it is focused on very specific topics which seek to answer certain problems. As compared to basic research, applied research is more often linked with the improvement of technology as it covers the direct application of knowledge. While basic research aims to predict future phenomena, applied research seeks to prevent predicted problems or come with solutions for future challenges. The former deals with knowing what could happen while the latter goes beyond by coming up with probable actions. Basic research is driven by curiosity while applied research is driven by clients as the former is conducted to understand fundamental concepts while the latter is done to help solve individuals’ or groups’ problems. As compared to basic research, applied research is closely associated with commercial processes since it aims to create relevant products and services. 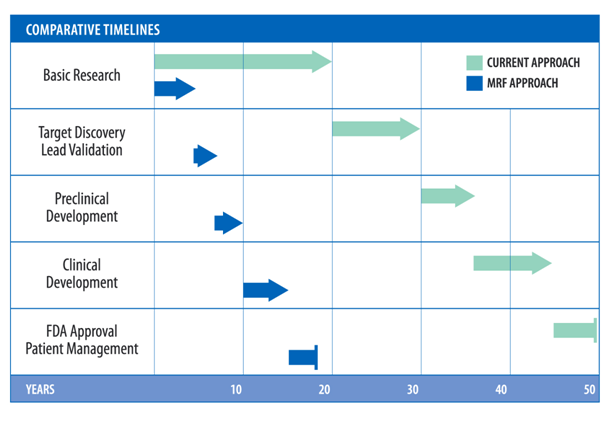 As compared to basic research, applied research is more closely connected with the development of economy as numerous surveys, experiments, and case studies are conducted to verify the efficacy of products, market strategies, and other economically related procedures. As compared to applied research, basic researches more often appear in academic publications as they delve into generating new knowledge. Basic research occurs in a sterile or highly-controlled environment such as laboratories. Conversely, applied research mainly takes place in real world settings where other unexpected variables may intervene. As to purpose, research is generally divided into two: basic and applied. Basic research can provide valuable information that applied research can use. Such inquiries form a cycle of advancement. Basic research is also known as fundamental or pure research since it is mainly concerned with the improvement of scientific knowledge. The purpose of applied research is to know more about a certain real-world problem and take steps to solve it. Basic research is theoretical in nature while applied research is practical; hence, it is associated with technology. As compared to applied research, basic research has a wider scope. While basic research predicts future phenomena, applied research creates solutions or preventions for probable problems. Basic research is curiosity-driven while applied research is client-driven. As compared to basic research, applied research is more closely associated with economically related objectives. Basic research mostly appears in academic publications. While basic research takes place in a sterile environment, applied research is often conducted in messy real-world settings. gene balinggan. 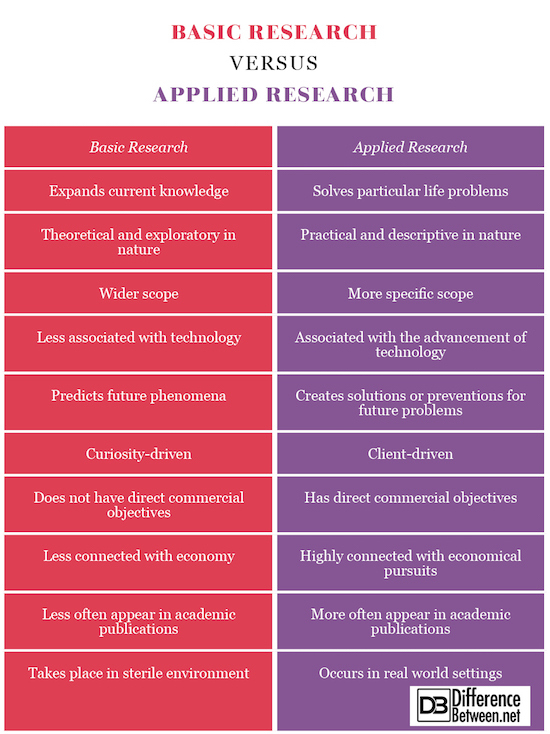 "Difference Between Basic Research and Applied Research." DifferenceBetween.net. May 22, 2018 < http://www.differencebetween.net/science/difference-between-basic-research-and-applied-research/ >. information helped a great deal… thank you. The Summary says: Basic research mostly appears in academic publications. The chart inverted the information. Corbin, Juliet and Strauss, Anselm. Basics of Qualitative Research. Los Angeles: Sage, 2015. Print. Gliner, Jeffrey , Morgan, George, and Leech, Nancy. Research Methods in Applied Settings. New York: Routledge, 2016. Print. Turabian, Kate. A Manual for Writers of Research Papers, Theses, and Dissertations. Chicago: University of Chicago Press, 2013. Print.